Cells use their signaling machinery to adjust their internal state to the changing environmental conditions. A well tuned signaling network is essential for maintaining the cellular homeostasis and its deregulation can lead to fatal consequences, such as cell death or uncontrolled growth. Even when isogenic, individual cells respond to perturbation in different ways due to different microenvironment, history and noise in their gene expression. Understanding the effect of signaling heterogeneity ultimately will lead us, for example, to design better treatments for cancer patients (Kim et al. 2018). Recent technologies allow us to investigate cellular signaling in heterogeneous cell cultures or tissues in much more detail than ever before. We study single cell datasets, in particular those obtained by suspension or imaging mass cytometry, and RNA sequencing (fibrosis project) based technologies. Mass cytometry (CyTOF) allows us to measure up to 40 phosphorylation sites of key proteins in the signaling network on single cell level. Furthermore, Imaging Mass Cytometry (IMC) can measure tissue slices, which adds spatial resolution to the data. This way, we can measure each cell within its local microenvironment and we can study, for example, the communication between different cells. Using Suspension CyTOF and IMC data, we have been working on novel mechanistic modeling frameworks building on our general methodologies for logic modeling in our tool CellNOpt (Terfve et al. 2012). We build Prior Knowledge Networks (PKN) of molecular interactions based on evidences found in literature and in databases, integrated in our tool OmniPath (Türei, Korcsmáros, and Saez-Rodriguez 2016), a highly curated collection of pathway resources. The PKNs are indispensable resources for constructing dynamical models. Then, we translate PKNs into logic-based ordinary differential equation models that capture quantitative aspects and are able to scale up well (MacNamara et al. 2012). These models are then fitted to single cell signaling (e.g. CyTOF) data upon perturbation. As an example, we are applying the above approaches in collaboration with Bernd Bodenmiller’s group to a kinase overexpression study (Lun et al. 2017). By connecting the overexpressed kinases to the signaling network we can reveal any changes of signal propagation due to change in the kinase abundance. The pipeline for modelling single cell, suspension mass cytometry data using CellNOpt. We have also been working on extracting knowledge from spatially resolved single-cell data. We have focused first on developing robust statistical methods. In collaboration with the group of Oliver Stegle at EMBL/DKFZ we developed Spatial Variance Component Analysis (SVCA). SVCA can, for example, show how much the cell signaling can be explained by intracellular effects and also by the phosphorylation state of surrounding cells (Arnol et al. 2018). We are currently extending this approach with a machine learning pipeline to identify relationships between proteins from different signaling contexts, e.g., intracrine, juxtacrine and paracrine. The identification of these connections facilitates the downstream mechanistic modeling and the integration of knowledge from literature and databases. 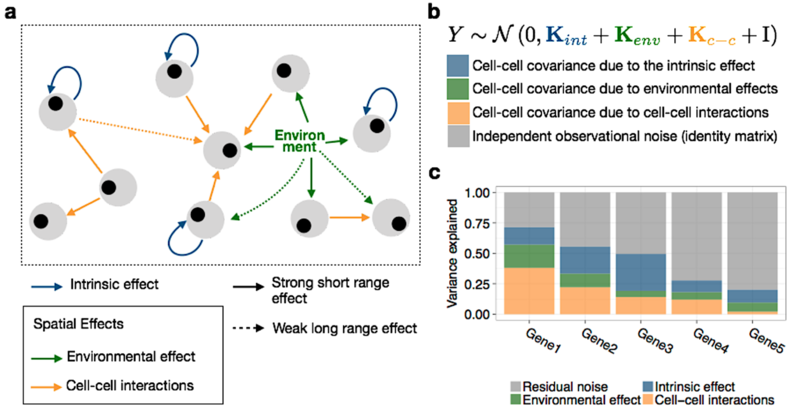 Modelling cell-to-cell interactions using spatial variance component analysis (Arnol et al. 2018). Arnol, Damien, Denis Schapiro, Bernd Bodenmiller, Julio Saez-Rodriguez, and Oliver Stegle. 2018. “Modelling Cell-Cell Interactions from Spatial Molecular Data with Spatial Variance Component Analysis.” https://doi.org/10.1101/265256. MacNamara, Aidan, Camille Terfve, David Henriques, Beatriz Peñalver Bernabé, and Julio Saez-Rodriguez. 2012. “State-Time Spectrum of Signal Transduction Logic Models.” Physical Biology 9 (4): 045003. https://doi.org/10.1088/1478-3975/9/4/045003. Terfve, Camille, Thomas Cokelaer, David Henriques, Aidan MacNamara, Emanuel Goncalves, Melody K. Morris, Martijn van Iersel, Douglas A. Lauffenburger, and Julio Saez-Rodriguez. 2012. “CellNOptR: A Flexible Toolkit to Train Protein Signaling Networks to Data Using Multiple Logic Formalisms.” BMC Systems Biology 6 (October): 133. https://doi.org/10.1186/1752-0509-6-133. Türei, Dénes, Tamás Korcsmáros, and Julio Saez-Rodriguez. 2016. “OmniPath: Guidelines and Gateway for Literature-Curated Signaling Pathway Resources.” Nature Methods 13 (12): 966–67. https://doi.org/10.1038/nmeth.4077.